HOURS OF OPERATION: MONDAY - FRIDAY: 9:00 A.M. - 5:00 P.M.
SVD is a secure storage facility located in Sarasota, Florida, that is built to withstand the strongest hurricanes and natural disasters in the area. 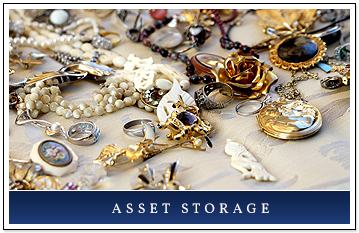 Here, our clients have access to deposit boxes, vaults, and secure offices in a facility that boasts the finest security, strength, and fire resistance available in the Southeastern United States. 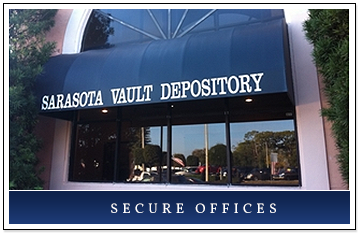 Here, you can get safekeeping receipts, private and secure offices, safe deposit boxes in various sizes, and walk-in vaults for rent. The space is environmentally controlled to ensure the proper temperature and humidity for fine art paintings, computer media, and other sensitive materials. We even store precious metals. We are a non-governmental entity offering anonymous, secure storage in a privately owned facility. 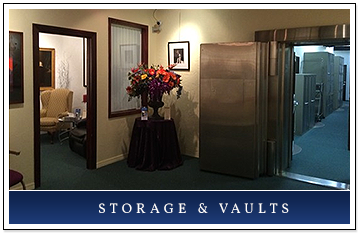 SVD is a highly-secure vault facility where we rent out deposit boxes and walk-in vaults which can house large collections, artwork, jewelry, coins, and fine art. We primarily serve the West Coast of Florida, but our clients come from all over the country, as well as from around the world. SVD is a non-governmental, private business with anonymous accounts available for deposit boxes and other secure storage options. We also provide man-trap entrances, private gated vehicle drive-through areas, and all of the latest security features, including 24-hour videos and alarm surveillance. For more than 24 years, we've helped people all over the world keep their belongings safe. We have more than 24 years of experience and can ensure that your property is as safe as possible. Protect your most treasured belongings and information with secure SVD solutions.